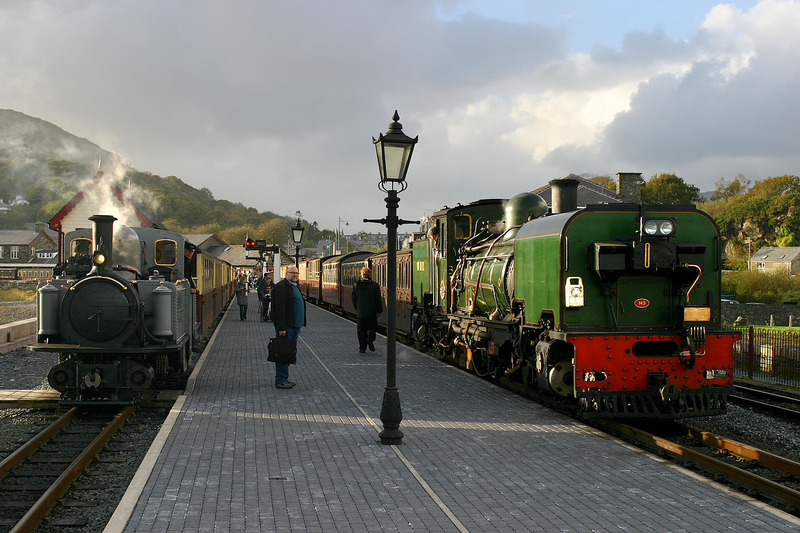 A narrow gauge motive power contrast at Porthmadog on 21 October 2014. On the right, Beyer Garrett NGG16 Class 2-6-2+2-6-2 143 has just arrived with the 14:15 Welsh Highland Railway service from Caernarfon, while on the left Ffestiniog Railway Fairlie 0-4-4-0T 12 David Lloyd George has just moved forward in readiness to shunt the empty stock off the 15:05 train from Blaenau Ffestiniog. This picture gives a good view of the new £1m platform, which allows both Ffestiniog and Welsh Highland trains to occupy the station at the same time.